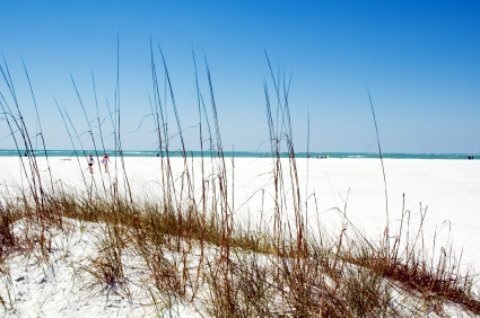 Siesta Key Beach Florida is a regular winner in Top Beach contests. Recognized all over the world for perfection in sand and water quality, this beach deserves all the titles accumulated over the years. sugary white sand in the entire world! If you are looking for the perfect tropical paradise vacation for a romantic interlude, look no Siesta Key Beach. Many couples come for a honeymoon and then return annually for a lifetime with their children. Siesta Key Beach Florida is a barrier island nestled between Sarasota Bay and the Gulf of Mexico. Siesta Key is part of Sarasota (the city) and one of the widest beaches in Florida. You will never feel crowded here. So, bring a favorite book, grab a chair and umbrella and relax, enjoy the peace and quiet as well as the surreal beauty of the beautiful azure water and the world’s best sand. Get carried away by the pleasurable and relaxing atmosphere this gorgeous Siesta Key beach offers. Treat yourself to a relaxing massage or boxy wrap at Massage Experience, where the massages are wonderful. A romantic getaway would not be complete without a visit to Siesta Key Tropical Wines, a small wine shop where you can enjoy fine wining and dining (and delicious snacks to take home). The Ringling Museum of Art is located nearby and should not be missed while in the area. See some of the most beautiful art in the world here in one of the most beautiful buildings in the world (former home of the Ringlings). Shopping, shopping and more shopping! Take a leisurely stroll on Palm Avenue and enjoy antique shops, fine art and jewelry shops and fashion outlets. For kids of most ages: Housing a 135,000-gallon tank, Mote Marine Laboratory and Aquarium has a tank full of marine animals as well as several other exhibits with sharks, lobsters, seahorses and more for kids of all ages to enjoy. Eating: Enjoy live music while munching on great seafood creations and enjoying tasty drinks at The Siesta Key Oyster Bar. If you want an authentic Italian meal, Bella Roma Italian Restaurant offers just that, along with a wonderful ambiance. Sleeping: Tropical Sun Resort is close to the beach and offers comfort, privacy and convenience all under one reasonable price. Tropical Shores Beach is a little more expensive but also offers a friendly staff and convenient location to Siesta Key Beach. If you absolutely must leave Siesta Key Beach, try neighbors such as Sarasota for museums and so much more and don't forget Venice, known for sharks teeth. Go on, buy a necklace with a shark's tooth and tell your friends you wrestled the shark for hours to extract that very tooth!